From left to right: Cassandra Windju, Heather Bloom & Bill Patterson, Dan Sleeper. Heather Bloom, curator at Cabrillo Hort. 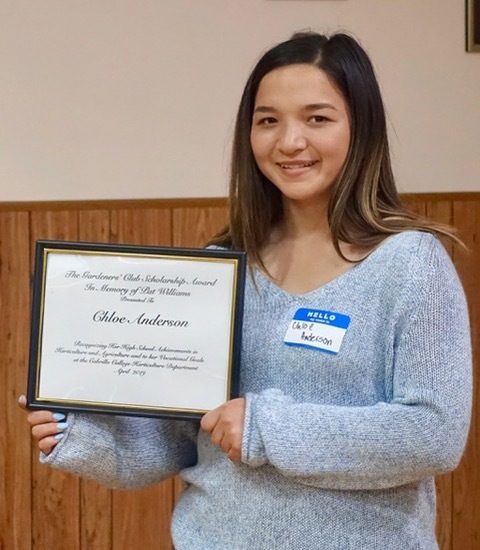 presented Cabrillo Horticulture students Cassandra and Dan with The Gardeners’ Club $500 scholarships at the April 11, 2019 meeting. Bill Patterson is the Scholarship Chair of The Gardeners’ Club. The $500 scholarships awarded to Watsonville High school student Julie Avila (2nd from right with her dad, Frank Avila and teacher, Paulina Correia) was presented by Marcia Meyer (left front) in memory of Pat Williams. 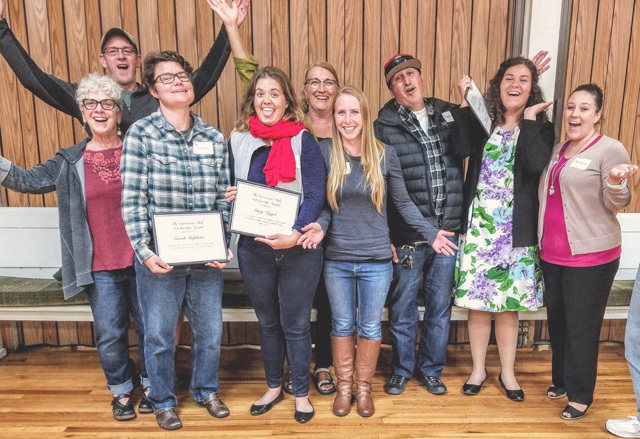 Cabrillo College Horticulture students Sarah Stephens (left-front holding certificate) Mary Vogel (also holding certificate) & Jerry Liggins (unable to attend) $500 scholarships were presented by Heather Blume (center-back) & Peter Shaw (left-back), and 2015 former recipient Rachel Golden (center) in the memory of Virginia Saso and Patty Connole. Thanks to our Scholarship liaison Bill Patterson (shoe in right lower corner) for creating the certificates. In the summer of 2016 our beloved member, Patty, passed away. 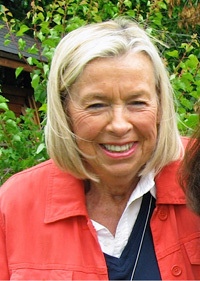 Her name was added to the Viginia Sasso award this year. 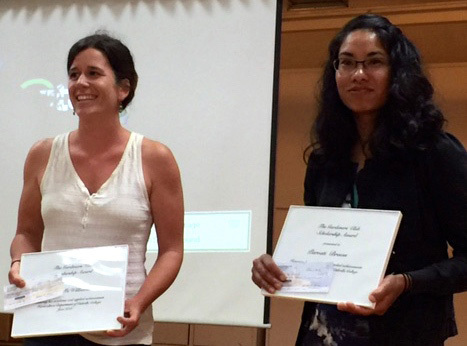 Heather Blume (top left), the Nursery & Garden Curator at Cabrillo Horticulture introduced students Kelly McWilliams (left) & Parvati Brown (right) and Suzanne Caron (top right) of The Gardeners Club presented them each a $300 scholarship award at the June 9th meeting. 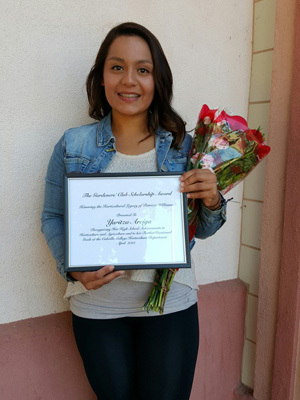 The Gardeners’ Club provided one High School Senior and two Cabrillo College students demonstrating an interest in a career in horticulture/agriculture with $300 scholarships. 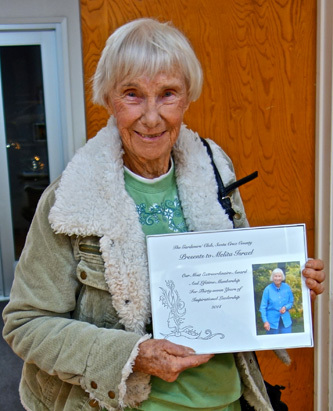 The high school award honors Pat Williams, our dear friend and garden club member who died in Dec. 2014. The other scholarship awards are granted at the behest of the Gardeners' Club general membership. 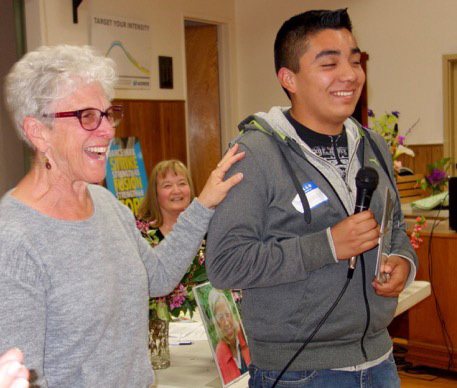 In April the Gardeners’ Club awarded a $300 scholarship in the memory of the late Pat Williams to Jonathan Nunez-Esquivel, who was nominated by his Watsonville High School FAA advisor Paulina Correia and selected in a process involving the ROP program, County Office of Education and The Farm Bureau with The Gardeners’ Club liaison, Marcia Meyer. 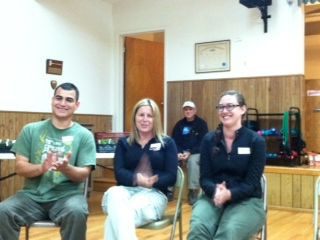 Jonathan received the award at the April 14th meeting with his family & teacher in attendance. The Gardeners’ Club provided two High School Seniors demonstrating an interest in a career in horticulture/agriculture with $300 scholarships. 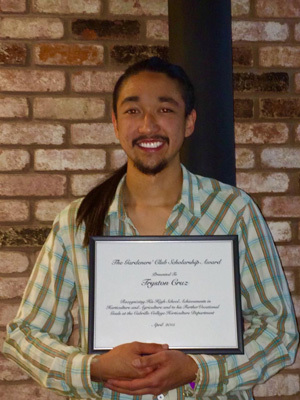 On the left, Tryston Cruz from Coast Redwood High School, recipient of the 2015 scholarship in honor of Pat Willams. On the right, Yuritza Aciga from Watsonville High School, recipient of the 2015 scholarship in honor of Pat Williams. 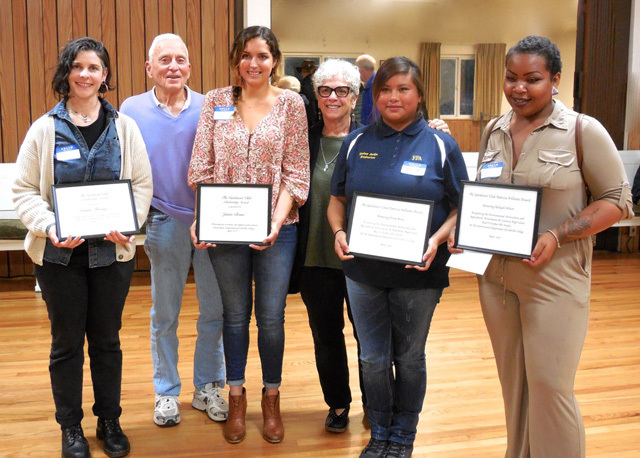 Scholarship Awardees, Cabrillo College students Laura Palmer and Rachel Golden at the Gardeners’ Club Scholarship Awards April 9, 2015. Presenters, Kathy Navarez (holding flowers), Andrew Wall (baseball cap) and Peter Shaw (center back) with Club President Cherry Thompson and Scholarship Chair Bill Patterson (left). See a close-up of the award. This was a surprise for Melita. 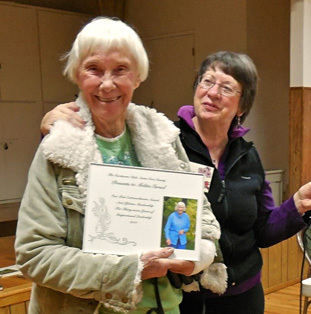 When she entered our January meeting she had no idea she was to receive this special award. More about her and photos of her garden can be seen on page 4 in the August 2013 Newsletter. The Board of Directors established the VIRGINIA SASO $100 AWARD at their July 26, 2010 meeting, to be awarded annually. The recipient will be determined by the Board. 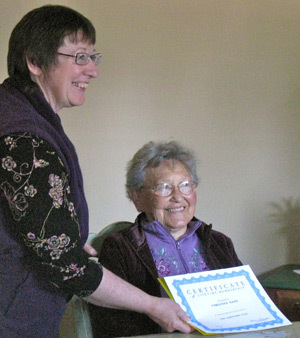 This award was established in 2010 to honor local herbologist, Virginia Saso. 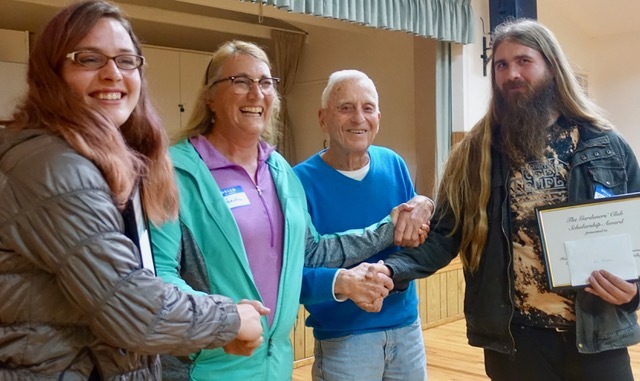 Many local area gardeners and landscape professionals were former interns at the internationally known Saso Herb Garden in Saratoga, which Virginia Saso co-owned with her husband Louis before the couple retired to Santa Cruz county. The Gardeners' Club meets the second Thursday of each month at the Aptos Grange. The Gardeners' Club Scholarship Chairperson, Bill Patterson (left) and Peter Shaw of the Cabrillo College Horticulter (right) are shown flanking the 3 Cabrillo Horticulture students each having been presented with a $300 scholarship. 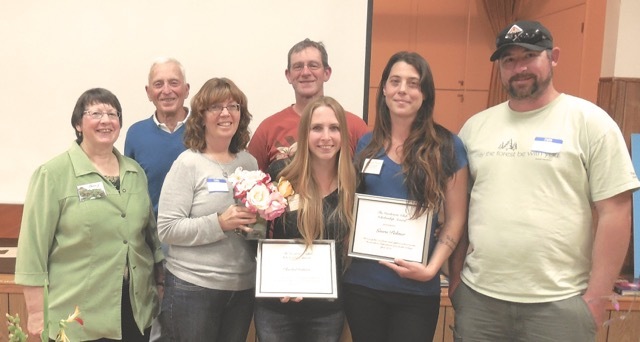 Bill Patterson, Scholarship Chair for The Gardeners' Club, (far right) awarded three Distinguished Cabrillo College Horticulture Scholarshipsat the May 9th meeting at the Aptos Grange. The contribution of Ernie Wasson (far left) was recognized by establishing an annual award in his name as well as continuing with awards honoring lifetime member Virginia Saso. Students receiving $300 checks are David Apple (Left in photo), Max Laddon (center of group) and Jolene Guth. 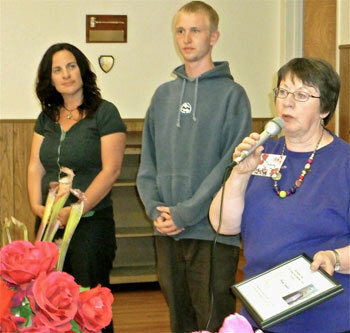 Cherry Thompson, President of The Gardeners' Club presented the annual Virginia Saso Award to two outstanding Cabrillo College Horticulture students, Kimberly Emigh and Kevin Landaw; each received $300 stipends at the May 10, 2012 meeting. The 2011 Virginia Saso award was Cabrillo College Horticulture Department for the purchase of books. See the letter. Virginia Saso receiving her Life Time Membership and the first recipient of the Award named after her.